Class 7 had a fun filled day today. Once everyone had arrived we had some Discovery Time where many of the children played at different stations. Some made origami, while others played with lego. After a music lesson with Yasue-sensei, Class 7 joined Class 8 and 9 to practice for their graduation ceremony. All of the children are getting very good at remembering what to do and when. After a very filling lunch, we began to write the final versions of our story books. 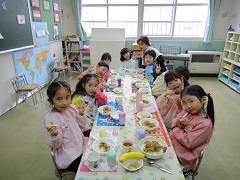 The children were able to write their stories in English very nicely. I can’t wait to see them when they are finished!